The universe has many mysteries. One such mystery is why…oh why, did people ever decide wall to wall carpeting in the bathroom was a good idea? I suppose this mystery isn’t completely unsolved to the masses of the world. You may be one of those individuals who put carpet in your bathroom. WHY??? I am bringing up this topic today because I am one of those people who own (I guess I should say rent? but that sounds strange!) 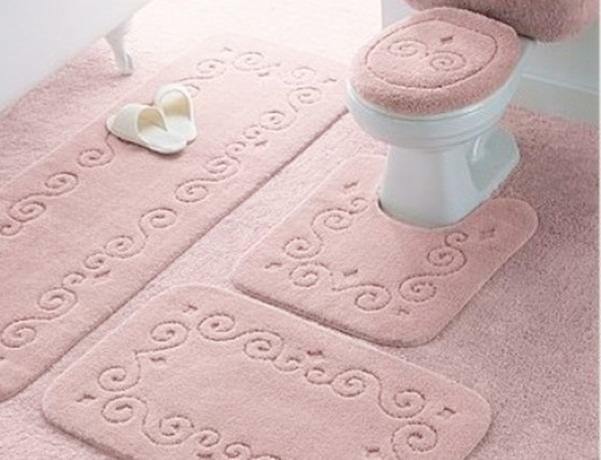 a bathroom in which the entire floor is blanketed in carpet. I should note that I DID NOT put the carpet there. I’m pretty sure it’s been there for nearly 50 years. (Along with all the appliances in the house! The house is like a well preserved view of life and interior designing in the 1960s.) At one point I think the carpet was pink, matching the tiles on the wall and shower; slowly it has faded into a dull, liver and pink colored monstrosity. You ask: Autumn, why not just rip the carpet out and tile the floor? Stop fussing! The people I rent from are ever so nice! They are literally the nicest of the nice. But they like the carpet in there. I cannot bring myself to ask why. It might change my opinion of them. I’M KIDDING! They like it because tiles are cold and hard and carpet is a softer, warmer option. All I can think is: True…but what if the toilet over flows? What if you spill your hair gel on it? And again…what if the toilet over flows??? Another reason I am bringing up this topic today is because over the weekend an incident occurred involving the said carpet. It all started on Friday. Whoops! I didn’t! Glad I checked. The cords are ripped from the wall and I am whirling around to turn off the light and leave. Huh? Is it just me, or does it look like a section of the carpet is extra dark– more liver colored than the rest? Perhaps it is just the lighting. I inch closer. Strange. Then I remember the time. Got to go! I will investigate later. I return from work, walk into the bathroom and jump back. Yeah…that’s not discoloration. Or the lighting. A sopping, puddle of what I imagine probably emerged from the toilet has taken over more than half of the bathroom. The only thing one can do in this situation is scream in horror. Toilet water. It may be clean looking, but we all know the word clean should never be used to describe toilet water. Oh! And how the carpet loves it. It is drinking it right up. I have no idea how the water has escaped its ceramic prison, as no one used the toilet at all that day, but the fact of the matter is… it has. I am an adult. And being an adult means you have to do things you don’t want to do. You have to pay for things you don’t want to pay for. I had to clean this mess up. After soaking up the water the best I could and pouring sterilization cleaners on the carpet I realized…how can it ever possibly get truly clean? Carpet has so many nooks and crannies, twists and turns. I could burn it. I could burn the blasted carpet and be rid of it FOREVER and the bathroom would be clean once again. It is too bad burning it was out of the question. But I think I just might have the winning argument for ripping the carpet out and tiling. Cross your fingers! I’ll end my story now, and put it in that lovely storage room of case files filled with the mysteries of the universe. With a big permanent marker I’ll write across the top, “This file contains information to solving the mystery as to why people carpet their bathrooms wall to wall…and evidence on how this practice SHOULD BE ILLEGAL!” Lengthy, but necessary. A few paragraphs from Book II! A few paragraphs from my second book! This has a small glimpse of one of my favorite characters: Miss Sadie Bee. Mercedes shook her head. If she thought about Kale Desmin one more time today she may as well start a fan club for him, complete with jackets and autograph signings. He was such a mystery and one she wouldn’t mind solving…at least in her wildest dreams. Mercedes hesitated. How she wanted to let out her secret. It was like steam trapped in a tea kettle. Sadie Bee could be trusted, but the problem was the entire house (other than Pearl and Mrs. Tyson, of course) hated Kale. Mercedes would have to bring him up in a roundabout way. “I was just…thinking…about Ka–Mr. Desmin,” she let the name hang in the air. “No particular reason…” Mercedes started. She drummed her fingers on the table. “But I wonder what his fiancé was like; I wonder if he loved her; I wonder why he left her.” She looked off again, reimagining the pain in Kale’s golden eyes as he spoke of the girl. You can change someone’s life, and it’s not that hard. Isn’t it amazing after you get a sincere and very specific to you compliment, or after someone gets you flowers for no reason at all, or after someone asks you a question and really listens, you feel recharged…important…a little more confident. Sometimes you feel more daring– you take risks…because you believe you can succeed. And sometimes…you DO succeed…life takes you places you would have never dreamed you’d be. Your life changed because someone took the time to make you feel special, like the somebody you were all along. Challenge: Compliment someone in a very specific way. Don’t just say they are awesome, tell them very specific reasons why they are awesome. Compliment the barista that always makes your coffee ridiculously perfectly and always remembers your order (which is so confusing you’d think it was some kind of math problem); compliment a family member (sometimes, they are the ones who need to hear it the most). Yeah, this “challenge” is something so small, but small things matter…and lots of small things make a difference. If you’d like, share your story! Or share a story of when somebody made YOU feel like a SOMEBODY. Was a place I longed to go. A place I only dreamed to be. Grassy pastures and a crystal creek. And tell of the wonders down below. But I was trapped in fate’s embrace. I was perched on a cliff narrow and steep. It was the one price required to pay. There was the chance one wouldn’t survive. I chose to stay and never to fall. I lived up here…all alone. I never truly lived, because I was afraid to die. Not to waste one more day. I step over the edge, and take the fall. And I discover all along, I had wings. Don’t be afraid of to fail, be afraid not to try.